People want to know how we do it. Or rather: they want to know how we pay for it. An answer like this is easy to understand and allows us to label it and file it neatly away in our brain-boxes. While we technically went abroad after getting married, the fact that we’ve been traveling for about a year means the term honeymoon probably isn’t appropriate (although that won’t stop us from calling it this). And while we did carry a ridiculous number of backpacks around the world with us, we’re not broke or European, so the classic backpacker designation isn’t quite accurate. Neither of these two categories allows room for “working” to be part of the travel equation. 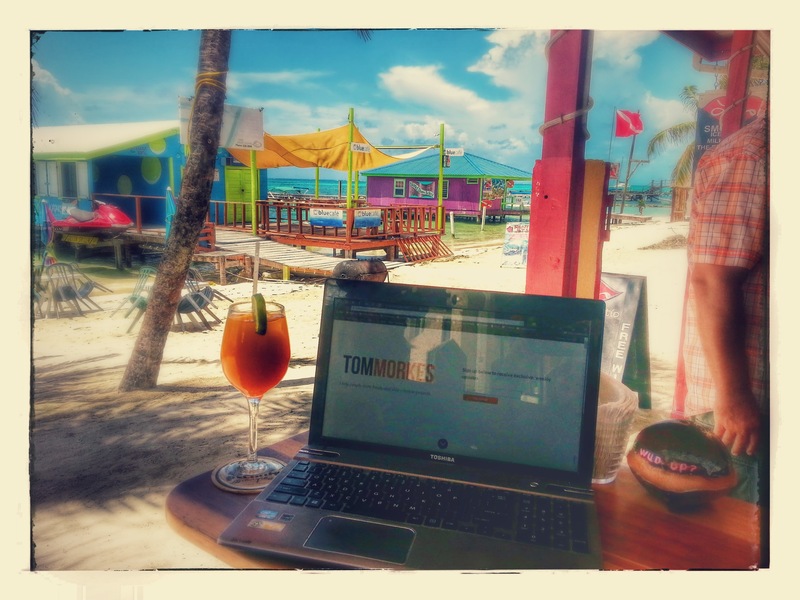 The idea of working WHILE you travel, completely by choice (as in, not being paid by National Geographic to take pictures of elephant balls), is a foreign concept to just about everyone in the world. Which is why I don’t try to explain what I do at all anymore. Too complex and most people don’t really care. Some people who read my blog or books and know I travel while I work HAVE asked the question, legitimately, and want specifics. So here are answers to questions I’ve been asked at one point or another (with probably more details than you want…deal with it). p.s. I created a “Work + Travel Abroad Toolkit” for weirdos like me who enjoy traveling wherever they want in the world while working simultaneously to pay for said travel. How do you afford to travel around the world for a year? This is a loaded question, but here goes. I didn’t really have a dollar amount I wanted to save before I started traveling, but I figured the higher the better. At a minimum, if you want to come away debt free, try to save $100 per day you intend to spend traveling (100 days = $10,000). There’s no scientific reason for this, except that we wanted to keep our budget to $100 per day and were actually able to do this (more on this later). 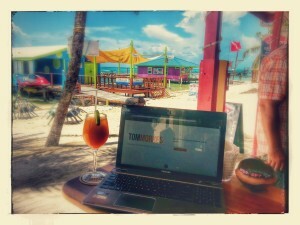 Passive income doesn’t really exist online, but it does exist offline…in the real world. A lot of people get turned off by the seeming complexity of stock investing and real estate investing, and so they do what the plutocratic-industrial complex tells them to do – invest in mutual funds and maybe bonds or CDs if you want to be really safe, and for homes: buy the house you live in because it will go up in value over time. If you want to follow that advice, go for it. For me though, I like to do the opposite of what the majority of people do (which is always fragile), so I focused on stock option trading and rental properties (antifragile and robust investments). Now, every month as I’m traveling, I make extra income from my rental properties, which have full time managers. I spend about 30 minutes a month managing the managers on average. If you want more info on these kind of investments, I’m not certified in anything except being a badass, so you should still ask a certified professional something or other. Okay, so this is the meat-n-potatoes of what I do. The passive income is good and the savings help, but the reality is: I wouldn’t be able to afford what I’m doing if that was all I had. The key for me has been to create new revenue streams as I travel. This list doesn’t include all the failed projects and attempts that never got off the ground. The point is: creation is a hustle. To create new revenue streams takes time and effort – but if you enjoy creative work, it’s an absolute blast (I seriously love working as much as I love traveling, which is weird according to a lot of people). As far as practical ways to get started on this…you’re reading this blog, right? What you track you improve. Whether it’s weight loss, habit change, or business – the things we measure are the things we’re able to change for the better. When you start your around the world travels, you’re going to want to start tracking your finances. It’s a simple google spreadsheet that we update every time we made a purchase. This gave us insight into how much we were spending so we could stay under our limit (under $100 on average). 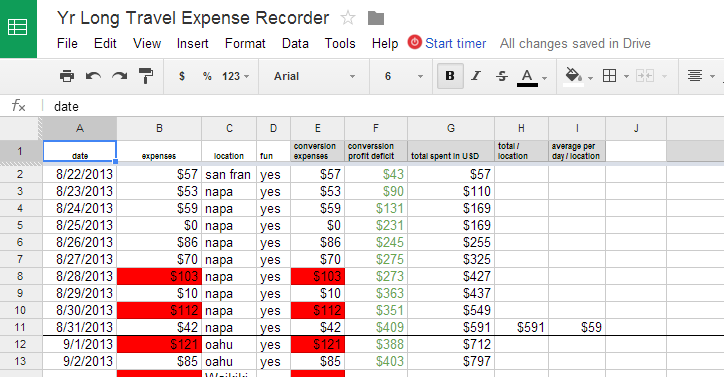 If you’d like a copy of the spreadsheet for your own use, grab it here. The following are a bunch of questions I’ve gotten from people, so figured I’d share my answers with all of you who are interested. If you have your own questions, leave one in the comments and I’ll answer. Do you access your American bank accounts online? Yes. I have multiple bank accounts and I access them all online from anywhere in the world. Just in case, it helps to let them know where you’ll be and when so they don’t lock you out (which has happened to me). Do you need a special debit/credit card when you travel? What credit card should I get for travel purposes? I use Chase Sapphire preferred. It’s the most baller credit card out there. By signing up for two cards, we had enough miles to fly international (USA to Philippines) for about $200. Not bad, right? Do you simply pay whatever bills you have online while abroad? Yes. This works 99% of the time. Worst case scenario, I ask people at home that I trust to help me out (although I can’t think of a time this has been necessary). When you make money, is it going into American accounts? If so, does that mean tax season is same as it always is or do you have to make particular changes since you were traveling? Yes, all American accounts. Since I was only outside the country for less than half the year, all income earned abroad is still taxed by the United States (one of the major bummers of being a US citizen, since few other countries do this). I run my business through an LLC so everything is taxed as individual income, so whatever my bracket would normally be – that’s what I pay (the bonus being I can use income from my business to pay business expenses, which could potentially knock me down a tax bracket…another reason everyone should own a business). Do you have to have a certain type of visa to travel and work? Nope. I don’t specifically enter any country to do business, persa (although I do work as I go, and I’ve presented at conferences, seminars, etc.). I suppose this would be something worth checking on if you’re planning to get an actual part time / fulltime job while you visit a country. For example, my wife teaches yoga, and in most countries she needs a work permit to teach (although some countries are much more relaxed than others). Any good sites for finding the safe areas and hostels to stay at? Or other safe housing? HostelWorld.com + AirBnB.com are great resources. We also Google the areas to find out if there’s anything crazy going on and if you want to get real detailed, the US govt. has a website that can fill you in on all the potential terrorist threats around the world (if you want to be prepared Liam-Nieson-Taken-style). Do you carry a weapon when traveling? Just my fisticuffs. We haven’t had any issues or any close calls. We’ve been to some ‘sketchy’ areas too like Johannesburg, South Africa, as well as all over Indonesia, but we’ve never had a problem. Everyone warned us about S. Africa, so we just made sure we didn’t wander back alleys at night and we ended up okay. I’d say most threats are exaggerated – but we also try to use common sense when traveling (again, don’t travel down back alleys at night, don’t get blackout drunk at new locations, travel in groups if you can, etc.). Alright, so that’s all I can think of right now. If you have any additional questions you’d like answered, leave a comment below. Tom….You the man! Aunt Kathy and I have been reading your blog almost daily for the last year….great fun. You’re definitely a young and more handsome Tony Robbins….kinda….maybe…sorta. Tom, this makes traveling more appealing than it has been in years. Just have to get my husband on board. I like the way you present information and am looking forward to your class. Thrilling throughout. A record for posterity!